We started growing seed in 1939 we continue to grow seed and work on regenerative agricultural management systems. We look at low cost, low risk production techniques focusing on soil health. We now grow seed soybeans, spring and winter triticale, perennial ryegrass, and sainfoin, have short term alfalfa in rotation, and grow cover crops and grazing corn. We need to know what we are selling. We started growing soybeans in 2001 and corn in 2000, trialling varieties for local adaptation. 2010 is when we started with cover crops, and are screening for new species to use. We have demonstration plots on the farm to show local agronomics and how varieties compare, side by side. By staying active in local activities and marketing groups keeps us sensitive to your needs. We have marketing options available to our seed customers for their products. We Know What We Sell! We now grow seed soybeans, spring and winter triticale, perennial ryegrass, and sainfoin, have short term alfalfa in rotation, and grow cover crops and grazing corn. 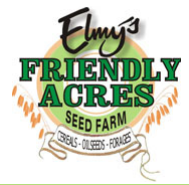 © COPYRIGHT Elmy's Friendly Acres Seed Farm ALL RIGHTS RESERVED. SITE BY AdSpark.